The nature of the prison industrial system is highly exploitative of the labour of incarcerated workers. Incarcerated workers are paid about £1 a day for their work but this is received in the form of credit to spend inside the prison rather than in cash. 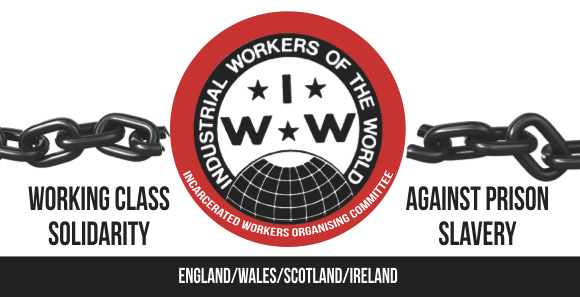 As a revolutionary organisation that aspires to build one big union for all workers, we want to express practical solidarity with members of the working class who are incarcerated and to give any incarcerated worker who wants to join this union every opportunity to do so. Having no access to cash, incarcerated workers have no way to pay dues to the union and are thus granted free IWW membership while in prison. Furthermore, recognising how difficult things can be for newly released prisoners, while they are adjusting to life outside prison they will not be liable for dues for the first 6 months or while they are still on licenced release. This dues-free period can be adjusted at the discretion of the branch. The Incarcerated Workers Organising Committee will produce dedicated membership application forms and membership packs for workers in prison. Slavery or rehabilitation? The debate about cheap prison labor, explained. Major riot at Winson Green prison! Worst disorder since Strangeways!